Benelong Carroll has emerged as one of Descendance Aboriginal Dance Companies most versatile performers. Benelong assumes the role as the Dance troupe’s number one Didgeridoo player, but has now developed as a leading singer and dancer. Benelong comes from The Gumbaynggirr tribe of Northern NSW around the Nambucca Heads region. 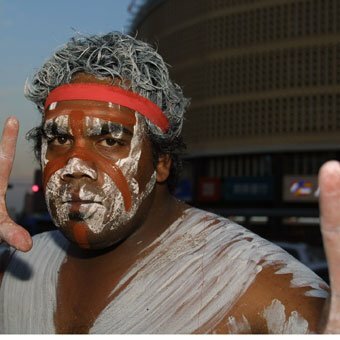 Many of the tribes of that region had lost a lot of their language and culture, but Benelong was fortunate to be trained into Aboriginal Dancing by other tribes from the Northern Queensland region, and with Descendance today this is the style of dance, song and didgeridoo he performs. Benelong is also developing a career in contemporary music, as a promising guitarist singer and songwriter, and was a vocalist and didgeridoo player for the CD “Creation” released by Descendance in 2008. NSW Aboriginal Health Awards, Waters Edge Restaurant. Beijing Olympic Torch Relay performance Canberra. Tours Croatia Serbia to promote Australia Week. Tours New Zealand, for Australia Week, performances in Wellington and Auckland co coordinated by Tourism Australia. Tours San Francisco Tourism Australia, followed by The Honolulu Festival in Hawaii and cultural performances on the island of Molokai. The Artkenciel Festival in the Reunion Islands one of the most exclusive festivals around the Eastern Coast of Africa with rising star Xavier Rudd. Descendance produce The Sydney Indigenous festival, Riverside Theatre, Mainland, Torres Straight, and fusion show Flamenco Dreaming. Descendance production of The Land The Sea, staged in Alice Springs, working with some of the cast of the film Whale Rider, including lead actor Rawiri Parente , first indigenous performance workshops musicals combining Aboriginal and Maori cultures. Descendance in New Zealand tour sponsored by Air New Zealand, Descendance performed at The Oz Talk conference at Auckland Showground. Descendance also performed for the traditional land owners of Auckland, the Ngati Whatua Ki Orakei tribe, they were given a fifty man Huka farewell. Seoul Korea the International Drum Festival. Descendance wins the First Cultural style Olympics in Seoul Korea at The World Culture Open sponsored by UNESCO. Descendance in Alice Springs at The Red Centre Resort, performing 2 shows a day, and winner of the Brolga Award for tourism in 2003, Benelongs duties included Singing, Didgeridoo and Dancing. The Blue Mountains region of NSW Australia is one of the most beautiful tourist destinations in the country and it is here Benelong showed his enterprise and maturity by helping start the Dreamtime Café, a popular spot in the mountains where tourists from all over the World drop in to hear him sing, play and dance.